A local Emirati Friend has agreed to open up his farm house to host a bunch of us and let us experience his hospitality and explore a bit of culture. 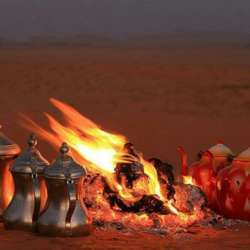 we can explore a bit of Local coffee & tea, and settle down for the evening, have a roasted sheep barbecue-local style and wind down for the night..
We experience a different kind of camping without sleeping , we can stay till late time or if you wish stay overnight, please carry your own tent/ sleeping bags and other requisites to keep yourself warm! Also, for dinner we plan to have a whole sheep roasted and few chickens! As a courtesy to the local host, this is going to be a dry visit and i expect who sign up for the event to adhere to this code . and most importantly, I expect who sign up to turn up, kindly cancel attendance if you are not sure of attending! this is in conjunction with Dinner nations group and Haytham will also coordinate this with me.bot our numbers are listed below.